OAK GROVE, La. 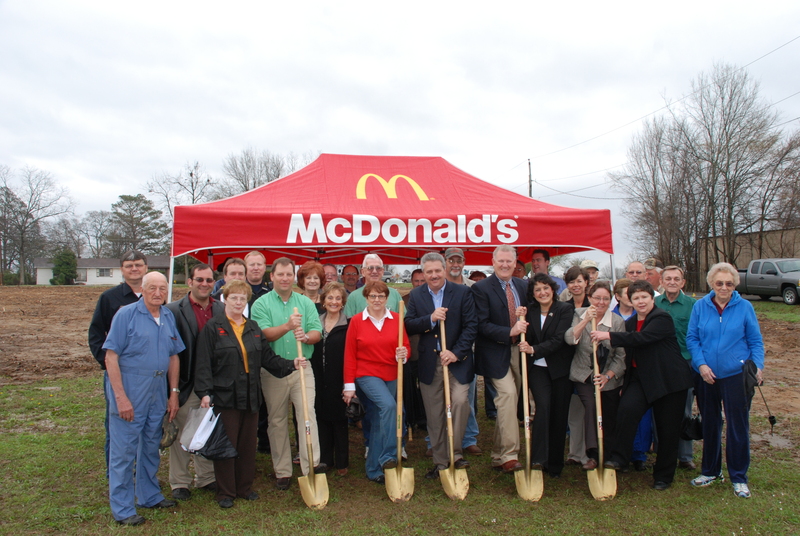 — Approximately 50 people braved the inclement weather Friday to celebrate the ceremonial beginning of construction of the new McDonalds to be located on Constitution Avenue across from Wal Mart in Oak Grove, La. McDonalds of Oak Grove will be owned and operated by Gilley Enterprises of West Monroe, La., which operates 20 McDonalds franchises in Northeast Louisiana and Arkansas. To show his appreciation to the area Gilley handed out red gift bags with the Golden Arch and Oak Grove, La. embroidered onto them. Gilley reported to the well wishers in attendance that once the final plans are approved by the Louisiana Fire Marshall’s office it will take approximately 120 days for construction to be completed and the store in operation. McDonalds will employ around 60 people initially with the possibility of more depending on demand.